Gettin his money's worth out of of those boots. Fine job cnc. Gettin his money's worth out of of those boots. One thing for sure, most of these bow hunters need to spend a LOT more time practicing their shots. Way too many gut shots or shots they have no idea where they hit a deer. Marginal shots are just part of it no matter how much preparation and planning. A lot of these folks are actually very experienced hunters. The intensity of the moment and the rush of adrenaline just get the best of all of us sometimes …..from a judgement standpoint as well as our shooting skills. Just about every shot you see me post a pic of is going to be a marginal one by default. That’s just the ones we trackers get called on. We’re the 10% crew. I wouldn’t expect to see many pics of deer smoked right behind the shoulder on here. On the first one the hunter feels like he hit too high. He said he thought it was about where it should be as far as front to back but it looked like the entry was just under the backstraps. He got a pass through but didn’t see any blood on the ground and just backed out to bring in a dog….. The first track this morning turned out to likely be a high shot just under the spine……We tracked the buck for around 800 yards and called it off after assessing that it likely wasn’t a good hit. 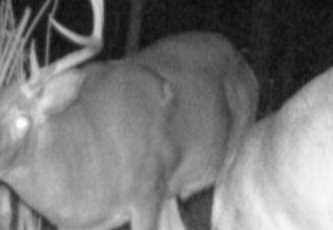 The buck from the call quoted above showed back up on camera. Look just behind the shoulder toward the top of the deer and you can see the wound. It’s amazing that deer can live from this but it’s proof that you can zip an arrow through one just a little too high and him survive. Another definite pattern I’ve seen with these marginally hit deer is that they will not “run off into the next county” and never be seen again as you hear some say. The vast majority of the ones that are just injured and not fatally hit will show right back up on camera. Sometimes its within days and sometimes it takes a couple weeks but they don’t leave their core area as a result. I believe it can actually be the opposite. I believe they sometimes condense their home range during their injured period. But there’s no such thing as a dead spot CNC. It’s not possible that the buck is still alive. I follow a guy from Ms on social media who shot the same but 3 different times this year. I believe he said high the first time, low the second time and third opportunity he killed him. I have never heard of anyone getting three chances on three different occasions at the same deer and with a bow at that. Just goes to prove they don't leave their core area like you mentioned. I think maybe there’s a little truth to both sides of the argument. I don’t think that its so much a void……I think its more likely that the broadhead is just clipping the top of the lungs (or a lung) and it doesn’t injure the organ enough to shut down its function. That same shot placement with a gun would likely be lethal due to all the extra damage caused by bullet impact. The bad shot with a gun is usually above the spine. There’re two different bad shots being made. I’m not sure that the deer really even knows what happened….….especially with a bow. If my dog gets scared or injured then they go to where they feel the safest. Deer do the same thing. Last edited by CNC; 11/07/18 08:56 AM. 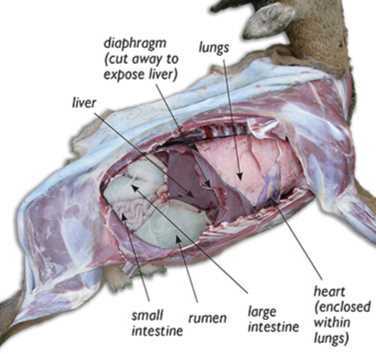 Hmmmm…….I just went back and looked at this cut out diagram of a deer’s internal organs and compared it to the wound in the trail cam pic…..I guess it would be possible to zip an arrow right through the edge of that leg plate and still miss the lungs and spine both. It’s a very small area right where you see the plate exposed in the pic... but it is possible I guess. I’m still of the opinion that you should aim a little farther back than most folks do. You have more room for error. The vast majority of the non-lethal hits with a bow come from hunters hitting too far forward in the leg or high on the shoulder, etc…. Last edited by CNC; 11/07/18 09:12 AM. That is a great picture, but I wish they had of pulled the legs down as if the deer was standing, and then cut away the front and rear leg and drawn in the femoral vein jugular and spinal column. That's a good point......So by that rationale, I guess it could actually make a difference if the arrow hit the deer while it was exhaling versus inhaling. You're talking about the difference in an inch or two but bowhunting is a game of inches. I’ve said this before in the past but its worth saying again……..Write a short note to your neighbor with your contact information on it….. Tell them that you want to exchange phone numbers in case you ever have to call in a tracking dog and the deer crosses the line. Put the note in a zip lock baggie and hang it on their gate with a piece of duct tape. In most cases it will be just that easy. It may even be a good ice breaker to forming long term relationships with your neighbor. It seems like very few people know their neighbors. Write a short note to your neighbor with your contact information on it….. Tell them that you want to exchange phone numbers in case you ever have to call in a tracking dog and the deer crosses the line. Put the note in a zip lock baggie and hang it on their gate with a piece of duct tape. In most cases it will be just that easy. It may even be a good ice breaker to forming long term relationships with your neighbor. It seems like very few people know their neighbors. It surprises me more folks don't do this. I’d be willing to bet that the vast majority of people have always just went and got their deer if it went across the line. Some folks may disagree but that’s really the common-sense approach when we’re talking about a deer that probably only ran 100 yards in most cases. That’s what I’d tell someone to do of they were my neighbor and I’d hope they’d say the same thing. Bringing in a tracking dog is a little different though…..we may go 100 more yards or we may go 2 miles. We may disturb very little or we may walk all over a place. There’s a good number of folks who know their neighbors when I go out and track but I’d say 7 out of 10 don’t. Take to the time to get their info now…..before you blow that one’s leg off opening day! Like I was saying, even if you don’t need to call in a dog this year….it may just be a good way to get to know your neighbors. It's probably a lot better way of breaking the ice than badgering them over what they’re shooting or where they have their stands placed. Last edited by CNC; 11/09/18 11:02 AM. It's probably a lot better way of breaking the ice than badgering them over what they’re shooting and where they have their stands placed. Call just came in for tomorrow morning from the youth hunt……A little girl shot her first deer this evening. Dad said the buck was standing broadside and jumped up in the air after the shot before it took off. All they can find is some hair at the hit site and no blood. We could be dealing with a gut shot or we could be dealing with just a grazed deer under the arm pits, belly, etc…..have to wait until we get there to find out. Last edited by CNC; 11/09/18 07:57 PM. No luck... ..The dogs never picked up on anything so all I can figure is that she just cut a little hair off of it. Last edited by CNC; 11/10/18 01:57 PM.